Fly through the air above the Bahamas and witness this tropical paradise as few get to see it, on our adventurous Bahamas parasailing tour. Lifted way above the serene, blue Caribbean, we provide you with the best possible way to take in the sights of this island paradise in one, massive panoramic scope. From your lofty vantage, you can observe the unfolding of the undulating terrain of the breathtaking Bahamian seashore, as you watch the turquoise waves lightly caress the bleached, white sands. 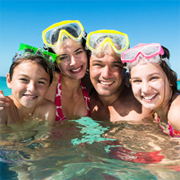 You can also spot a number of the creatures that live in the crystal clear Caribbean swimming beneath the sea. Look for the tiny silhouettes of tropical fish, sharks and sea turtles swimming about their daily business and be amazed at this multitude of life that we hardly even notice when sitting on the surface of the water. Get a glimpse of the islands of Bahamas from a different view, and see it from a bird’s eye view from a top while gliding over the clear water, while spotting wildlife in the ocean. People say how surprised they were by how smooth and relaxing this adventure activity actually is. It’s safe to say this tourist attraction is one of Bahamas’ go-to attraction, and for good reason. 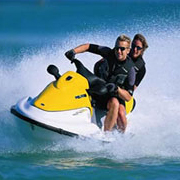 It’s one of the more inexpensive activities on the island, and it’s a guaranteed memorable experience. Experienced parasailing guides heavily inspect their gear to ensure your safety, and also start the tour with a safety lesson before taking flight. If you’ve ever wondered what it may be like to be a seagull, try this activity. 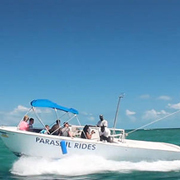 Ride out to the beautiful blue waters of the Bahamas on our 72-foot double decker catamaran vessel to experience the one and only Paradise Snorkel and Parasailing Combo package! This tour takes Bahamas watersports to the next level with an unforgettable snorkeling journey on the vibrant coral reef gardens to flying some 600 feet up in the air! Feel the exhilaration of flying as you glide over the clear water and impeccable beaches of Grand Bahama Island on this tour that truly takes you to soaring heights. 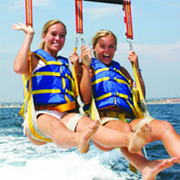 Go parasailing for an unforgettable experience during your time in Freeport.